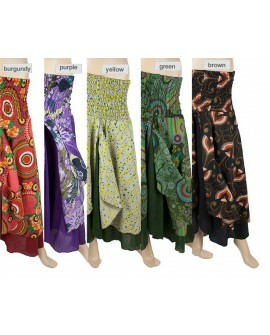 EarthyWear - double layer long skirt. Multiway, double layer skirt or dress (0058). 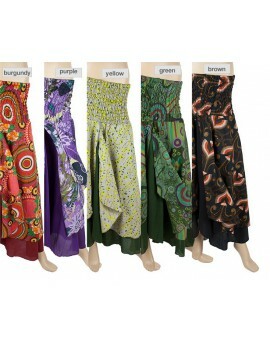 Beautifully made double layered, maxi gypsy/ hippie/ boho style long skirt / dress. It is made of 100% cotton and has a gorgeous printed pattern on the outer layer and plain cotton on the inner layer. The outer layer of this skirt has a lovely deep split and is slightly shorter than the inner layer which highlights the printed pattern beautifully, which also adds a lot of movement to this skirt. There is also a very long waist line which adds versatility to this skirt, making it possible to also wear it as a dress. This would make an excellent addition to any booho wardrobe.